Activity Type: Gastronomy. Preparation of a lamb with luche stew (Cazuela) that captures the essence of the Palena – Queulat area. Start: The rural inn, Mirador del Río, near La Junta, or in your own kitchen. End: That depends on you, but we recommend you stay a night or two in the inn, under the pretext of a prolonged, post-lunch siesta. Distance: 6 km from La Junta, along Route X-12, to Raúl Marín Balmaceda. Duration: The preparation takes 1.5 hours, approximately. Special Considerations: If you want to visit the inn and try this delicious recipe, call at least one day prior, so that Señora Francisca can have the ingredients ready! Cazuela is a one-dish meal; one of the most traditional dishes of Chilean cuisine. Its name is believed to derive from the large pot in which all the ingredients are cooked. The origin of cazuela is vague; its precise history difficult to pinpoint, although some believe that the dish originated as a result of an improvised lunch offered to Admiral Manuel Blanco Encalada, a Vice-Admiral in the Chilean Navy and Chile’s first President, albeit, provisional. But this dish has a much longer history relating to the Olla Podrida, a Spanish dish which was introduced in Chile by the Spanish conquerors. Each Region has their favorite variations depending on the ingredients predominant in the area, and of course, if you ask any Chilean, they’ll tell you that the version their mom makes is the best, with family secrets they could never reveal! The common element that makes a cazuela is a rich broth, served with whole of meat or chicken, accompanied by large cuts of vegetables such as potatoes, cabbage, pumpkin or carrots, rice, and fresh culinary herbs. Served hot, with fresh baked breads and garden salads, cazuelas are perfect for lunch or dinner and a delicious way to learn more about local flavors and traditions. That said, let us introduce you to the special version of cazuela that Señora Francisca Solis prepares for her family and guests. Francisca, or Pancha, as her friends call her, is the president of the Women’s Agricultural Club of the Valleys and the owner of the rural inn, Mirador del Río (www.miradordelrio.cl), located 6 kilometers from La Junta along the shores of the Palena River. 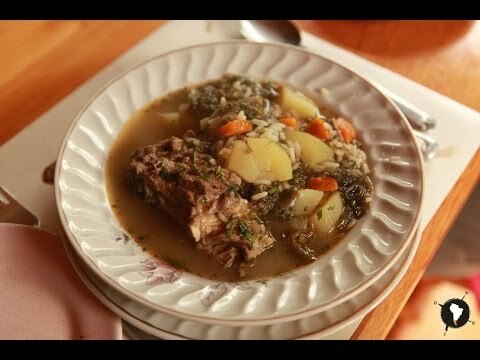 Her Cazuela de Cordero con Luche is both a gastronomic and a cultural treasure! Part of its magic lies in the ingredients: Luche (porphyra columbina), also known as sea lettuce, which is a nutritious algae native to the fjords of Aysén and much of the coast of Chile. Luche is one of the star ingredients in Señora Francisca’s recipe, a tribute to her mother, who migrated to Aysén from Chiloe Island, where most gastronomy is based on the generosity of the sea. Another key ingredient is fresh vegetables, harvested directly from Pancha’s greenhouses and gardens. And the meat component of this Cazuela is taken from the spine of a lamb, which, of course, was raised on Pancha’s farm. Why the spine? One of the deepest traditions of Aysén, involves the core values of using every part of an animal that is sacrificed; nothing goes to waste. You definitely want to hang out in the kitchen when this recipe is being prepared, especially so you don’t miss out on the glorious moment in which the luche begins to release its aroma and for an instant, the sea seems to sweep up the Palena River and into the very kitchen of Señora Pancha. And of course, you can also prepare your own Cazuela, using the ingredients we suggest here, or those of your own community – the important factor is freshness and an affection for the place and the plate. The flavors and culinary knowledge can be a memorable aspect of his travels in Aysén. Every corner has its own recipes and dishes . Discover your favorite recipes here.